Whether fair or not, we are often judged on first impressions. This harsh reality is nowhere better seen than in today’s ultra-fast business world where customers size you up in a nano-second based on your personal image. Since their impression of you will determine whether or not they want to do business with you, the impact on your career and on your organization’s bottom line can be staggering. Quick — name two words which, when frequently used by waiters and waitresses, increases tips by 12 percent. (Hint: it’s not please or thank you). Give up? The answer is, “…for you.” So, rather than saying to a customer, “Would you like some more coffee?” the savvy waiter would say, “I brought more coffee over for you.” The patron thinks, “Gosh, you did that for me, how thoughtful!” and tips accordingly — on average 12 percent more. How to improve telephone communication. Business building tips that cost nothing. In a world of TV ads that blare, e-mails that SHOUT IN ALL CAPS, and employees who talk when they shou1d listen, consider the advantages of making your customer communications quieter. Here are four touch points I share in my seminars when a strong/silent approach will differentiate you positively in your customers’ hearts and wallets. When managers plan their business strategies, common sense dictates that these game-plans should be in line with customer needs. The first step in planning is therefore to identify customer preferences. Unfortunately, most conventional approaches to determining customer needs are flawed. Here are five of the most common methods used to gather customer opinions along with their drawbacks. Keep these often-made mistakes in mind when planning your business strategy. In the days before e-mail entered our lives (up till the mid-1990s) the most pervasive interruption for the average manager was a ringing phone. Creating rapport with anyone in fewer than 30 seconds. We all know the power of first impressions. How people perceive us during the first few seconds of an encounter has a major influence on whether they will trust us, be attracted to us, or want to conduct business with us. To create a positive first impression, we need to know how to connect immediately with others regardless of their age, gender, ethnic background, mood, or the situation. “The problem with my salespeople is they’re not cold calling enough!” That’s the concern I hear most often from sales managers and business owners when I speak at conventions on how to boost sales. Yet when I examine their cold-calling strategies, I generally find they’re ill-conceived. 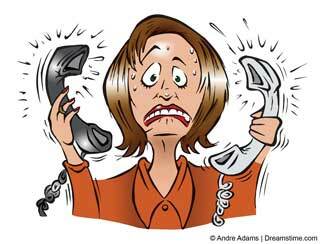 Decision-makers in most organizations soon grow weary of the large number of salespeople phoning them. So if you’re not well-trained when you cold call, I guarantee that you’ll face a lot of rejection. Interesting to hear the response from managers when asked about what factors impact sales. Many will reference the economy, customer demographics, competition, and recent innovations. While those factors certainly play a role, I often find, when brought in to train sales and service teams, that employees inadvertently chase away new potential customers. It usually happens within the first 10 seconds of customer communication, and most employees have no idea that they are committing these offenses. See if this is true in your organization. Consider these reasons potential customers may distrust you or your team members. How to up-sell without turning off your customer. If you and your employees aren’t trained on effective ways to upsell, chances are you either offend customers by being too pushy, or leave money on the table that customers would have willingly spent with you. Either option is costly. When organizations bring me in to train employees on how to increase revenues from current customers, I often find that not enough attention is paid to up-selling. You may have great products, but you can still have customer service problems caused by bad weather, equipment failures, or human error. While you can’t control external events, you can control what you say to upset customers. Certain phrases will serve to either defuse or enflame. After more than 20 years of speaking at conferences and training teams on customer service, here are my top 10 worst things to say to unhappy customers (from least offensive to most), along with tips for regaining trust. Conventional workplace wisdom espouses the virtue of employees being friendly with customers. While friendliness is a good thing, too often employees interpret it as encouragement to become their customer’s friend. That’s not such a good thing. The key question is what is the most appropriate and profitable employee-customer relationship? Having conducted customer service training seminars for hundreds of organizations over the years, I’ve come to the conclusion that there are five things every employee should consider as they develop relationships with internal and external customers. You have no doubt noticed that technology is changing the “face” of customer service. Traditional ways we used to interact with customers, win their trust, and keep them coming back are becoming irrelevant. Here are three of the most significant trends in customer service, and how you can position your business to capitalize rather than capsize in response. Perhaps you’ve noticed that customers are becoming increasingly hostile. Case in point was the highly publicized incident where a patron in a fast-food restaurant became so enraged that he attacked the restaurant manager. The customer spilled his coffee on his breakfast and when the manager refused to replace the meal, the ensuing argument led to violence that ended with the customer being arrested. Let’s admit it — when it comes to dealing with customers who are stressed, some jobs are easier than others. A masseuse working in a resort spa will have more pleasant customers than a lost luggage agent at a busy airport. If your customers are sitting in a chair at your hair salon, they’re likely to be more relaxed than if they were sitting in an examination chair in a dental office. It may be a popular advertising slogan — our customers are our number one priority — but as a manager, buying into that strategy will actually reduce your effectiveness and damage your business. I learned it the hard way.